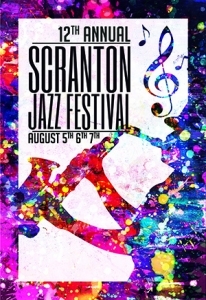 The Scranton Jazz Festival began in 2005 at the Hanlon’s Grove Amphitheatre at Nay Aug Park, Scranton, Pa. After a major snowstorm damaged the facility in 2007, the festival’s organizers moved the event to its present home at the historic Radisson Lackawanna Station Hotel in downtown Scranton where it has become a permanent fixture on the northeastern Pa. arts and culture scene. Presented in August for a three day weekend, the festival has attracted some of the finest international, national, and regional jazz/blues and world beat artists to showcase their world class talent. Combined with an outstanding staff of artisans, technicians, administrators and volunteers, the SJF literally transforms downtown Scranton in to a vibrant three days of high quality entertainment that has attracted thousands over the years. As a result not only has the festival been a high quality musical event, but it has also had a positive effect on the Scranton region’s economy. Scranton has had a rich history in jazz dating back to the 1930’s where jazz legends, Tommy and Jimmy Dorsey, performed regularly with the famous Scranton Sirens Jazz Band. Our area is also credited with hosting the first known recorded jazz festival, “The Cavalcade of Dixieland Jazz”, in 1951. Since its premiere in 2005 the festival has drawn audiences from the entire Mid-Atlantic region, resulting in tremendous notoriety and exposure to the international jazz world. The SJF can help revive our region as a cultural epicenter, spreading the arts throughout the northeast, no different than such festivals as Newport, Rhode Island; Saratoga Springs, Florida; and Monterey, California. The Scranton Jazz Festival simply wants to carry on this rich tradition while becoming a recognized contributor to the world of jazz/blues and world beat music in its own right. Last year, the Scranton Jazz Festival celebrated its first decade. It is the hope and desire of everyone involved that the festival will continue for decades to come. This summer The Scranton Jazz Festival will celebrate its 12th year at the historic Radisson Lackawanna Station Hotel and various downtown Scranton venues. In his travels across the country with the band, Jay Beckenstein has learned that the secret to getting people to a downtown is to make it attractive and livable. The saxophonist sees that in Scranton. More than 800 people attended Spyro Gyra’s performance at the Scranton Jazz Festival on Saturday night. The Grammy-nominated band, whose style Mr. Beckenstein described as ranging from “Caribbean to R&B,” brought people to their feet — and to downtown. Bob Shlesinger, a co-founder of the festival, started the annual event to bring something unique to the city. Eleven years later, Mr. Shlesinger expected to sell between 3,000 and 4,000 tickets during the three-day festival. Under the covered back area at the Radisson at Lackawanna Station hotel, people tapped their feet to the music of the Nate Birkey Group and bought the musicians’ albums. Bruce Keib and his family sat near the stage, excited to hear Spyro Gyra — one of Mr. Keib’s favorite bands. The Clarks Summit resident first took his sons to see the band play in Binghamton, New York, 25 years ago. “I knew I had to come see them tonight,” he said. After Spyro Gyra played its last song, festival attendees visited other Jazz Walk venues, including Adezzo, the Bog, Ale Mary’s and Posh, where other bands played their set lists. The jazz festival continues today. For a full schedule, visit scrantonjazzfestival.org. Contact Team Blu today for a FREE, no obligation consultation.